We’ve picked the best selection of outdoor adventures in each destination. 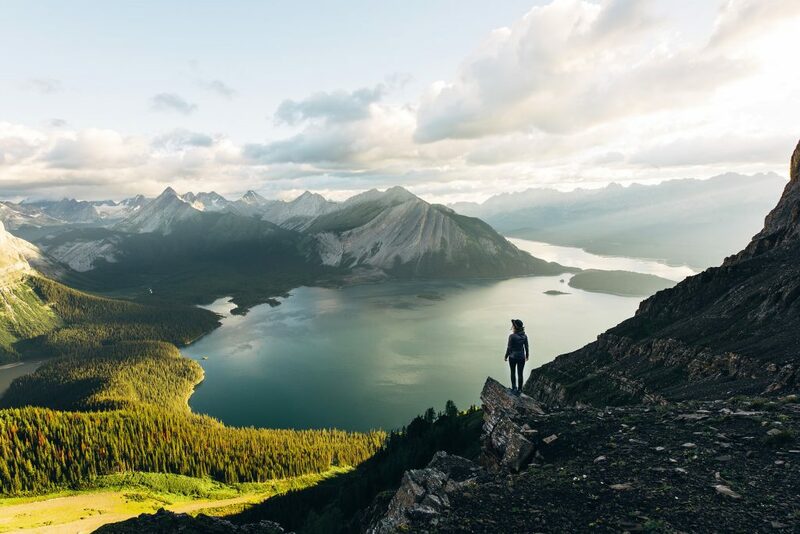 Scale a mountain in Banff on a VIA Ferrata adventure, hike to the world’s tallest waterfall in a remote mountain park, or paddle with whales in West Coast Tofino. We’ll make sure each activity suits your ability. The turquoise blue lakes of the Canadian Rockies, the desert-like valleys of the Thompson region, and the windswept surf of Pacific Rim National Park will keep your camera snapping at every bend in the road. Choose from unique ‘off the beaten track’ accommodations or our favorite hotels in the heart of the action. We’ll help you pick the perfect place to rest your head at night. Pick up your car rental at Calgary Airport and drive to Banff. The most action-packed twelve minutes of your life! Get up close and personal with the world-famous Three Sisters. You will want to reach out and touch them as you whisk by them before escaping into the Spray Valley where you will explore the extraordinary hues of the Spray Lakes. Savour an early dinner in warm log cabin ambiance before spending time at Lake Louise at one of the best and quietest times of day. Then head to Moraine Lake for the famous lake view from a scenic viewpoint, before heading back to Banff. Horseback ride along the tranquil Bow River, an area home to wildlife in among the thick marshes and grassy meadows – and pass by the historic Cave and Basin, the birth place of Banff National Park. Enjoy fantastic scenery as you climb up Sulphur Mountain around the Windy Knoll viewpoint. Overnight at Chateau Jasper. Your accommodation is conveniently located in Jasper National Park within easy walking distance to town for shops and restaurants. Enjoy the pleasantly furnished rooms with mountain decor in mind. Other features include an indoor swimming pool, whirlpool, fitness centre, casual fine dining restaurant and a lounge. Today, drive from Jasper to Clearwater. You’ll pass through Mount Robson Park before arriving in Clearwater, gateway to Wells Gray Provincial Park. Overnight at the Clearwater Lodge. Located on the doorstep of Wells Gray Provincial Park and the North Thompson River, the Clearwater Lodge offers breathtaking views and an abundance of outdoor activities. Hotel amenities include high-speed Wi-Fi, on-site restaurant, fitness centre, indoor pool, hot tub, sauna, and complimentary continental breakfast. Wells Gray Park, often known as the Waterfall Park, is one of British Columbia's most spectacular wilderness areas. It is not a well-known tourist destination, making it a good place to get away from the crowd. Discover Wells Gray Park in one day! Your guide will show you as much as they can of the great variety of habitats and landscapes.This vehicle-based hiking tour combines some of the best roadside sights in the Park with some short hiking trails. A true taste of Canadian river wilderness! From the famous Helmcken Falls, you will follow a backcountry trail along the rim of the 240m deep canyon with some of the best views in the park, before descending into the Gorge. Work your way through thrilling whitewater against the backdrop of canyon walls and pristine forests, giving you a chance to experience Wells Gray Park from an entirely different angle. The breathtaking thrills and beautiful scenery are rounded out with chances to swim and enjoy a short hike to a massive Class V Rapid! Enjoy an introduction to whitewater rafting with lots of fun waves and splashes in a section of the lower canyon on the Clearwater River. During this trip, you will also hike to a waterfall! Drive south to the semi-arid landscape of the Thompson Valley. Hear about tales of fur traders, train robbers and pioneers of Kamloops. Stories of Kamloops finest artists and artisans will introduce you to the rich history of Kamloops, one of the first settlements as the arrivals moved west. Enjoy a guided walking vineyard tour with great views of the South Thompson River and Lion’s Head Bluffs, stop at a honey bee colony and rows of Haskap berries and keep an eye open for wildlife. Then experience an intimate wine tasting in the mezzanine overlooking the wine cellar. Overnight at the South Thompson Inn & Guest Ranch. Just 15 minutes from downtown Kamloops, this charming resort is located on the beautiful South Thompson River. Enjoy cozy and comfortable accommodation within close proximity of a championship golf course. Dine at the on-site restaurant, or make use of the fitness centre, hot tub or seasonal outdoor pool. Travel through the high desert region of interior British Columbia, on your way to the mountain resort of Whistler. Overnight at the Crystal Lodge. Situated in the heart of Whistler Village close to shopping, dining and nightlife, this hotel is steps from Whistler and Blackcomb gondolas. You’re “at the centre of it all” staying here! Enjoy well-appointed rooms with complimentary Wi-Fi, relax in the heated pool and hot tub, unwind in the sauna or recharge at the fitness centre. The lodge also offers the most retail shops and restaurants attached to any one hotel in Whistler. Enjoy Whistler to the fullest and choose one of the following 3 experiences. Enjoy panoramic views of Whistler Village as you fly beyond the valley to explore the rugged peaks, majestic glaciers and lush alpine meadows of the Coast Mountain range. Marvel at the turquoise glacial waters of mile-high Garibaldi Lake. This tour features five different ziplines, perfect for anyone who wants a heart-pounding adventure! Experience spectacular panoramic views of Whistler & Blackcomb Mountains as you cross treetop suspension bridges and sky high viewing platforms in the old-growth rainforest. With epic views around every bend, the River of Golden Dreams features lush, old growth forest and wildflower-lined banks, as well as stunning snow-capped mountain vistas. While paddling, your guide will share their knowledge of Whistler’s fascinating history, geography and wildlife. Continue your adventure down the beautiful Sea to Sky Highway towards the ocean, then onto a ferry for a cruise across the Georgia Strait to Vancouver Island. Today, you will make the scenic crosswater journey from West Vancouver to Nanaimo. En route, keep an eye out for wildlife along the shoreline, killer whales and porpoises in the channel, and great bald eagles circling overhead. Tofino Resort and Marina is situated on the waterfront, a 10-minute walk from downtown. The resort features a restaurant and a pub, as well as a Marine Adventure Centre, offering plenty of activities and excursions. Enjoy the beautiful surroundings and close proximity to coffee shops and eateries. During downtime, relax in the comfy, West Coast style rooms. Sip a cocktail or craft beer at the pub. The West Coast of Canada is a very special place – rugged, wild and breathtakingly beautiful. Learn about the area’s fascinating ecosystems while keeping an eye out for whales spouting, feeding, spy-hopping and breaching! You may also spot sea lions, sea otters, eagles, and lots of other wildlife from comfortable indoor and outdoor seating areas. Enjoy a bear viewing tour with Jamie’s Whaling Station. Cruise through calm, protected inlet waters of Clayoquot Sound in search of Black Bears as they roam the shores in search of their favourite delicacy, the Rock Crab. View this magnificent creature in it’s natural habitat from the comfort of a 45’ panoramic cruiser, the Stellar Sea. This day is yours to enjoy and explore further in the Pacific Rim National Park. Enjoy long, uninterrupted stretches of sandy beach and Clayoquot Sound Biosphere Reserve, a protected area providing habitats for a vast array of species. Drive back across Vancouver Island and take a ferry to the cosmopolitan city of Vancouver. Today, you will make the scenic crosswater journey from Nanaimo to West Vancouver. En route, keep an eye out for wildlife along the shoreline, killer whales and porpoises in the channel, and great bald eagles circling overhead. Much too soon you leave the beautiful colors and crisp air of Canada behind as your vacation comes to an end. Overnight at the Buffalo Mountain Lodge. Located on Tunnel Mountain, this lodge is a leisurely stroll from downtown Banff for shoping and restaurants. Enjoy the surrounding 9 acres of towering fir, pine and spruce trees and observe the deer and elk that frequently nibble on the hotel’s lawn! During your stay enjoy cozy, well appointed rooms with wood burning stone fireplaces. Hotel amenities include complimentary on-site parking, on-site dining, WiFi, access to the hotel’s video library, a health club, outdoor hot tub, and steam room. Overnight at the Tekarra Lodge. Set amongst the towering pines, the property sits atop a ridge overlooking the convergence of the Miette and Athabasca Rivers in Jasper National Park. The mountain lodge is located just 2km from the Jasper townsite. Enjoy the rustic charm of the Canadian wilderness with a wood burning fireplace, perfect for cozying up with a book and a glass of wine. The hotel also offers binocular rentals, bike rentals, and complimentary WiFi. Overnight at the Helmcken Lodge. This rustic lodge is nestled away from the hustle and bustle of city life and is perfect for all ages seeking to explore, relax & unwind. The property is located just a short drive to all the fantastic places to explore, and provides the perfect ambiance for experiencing nature at its best. Overnight at Nita Lake Lodge. Overlooking the glacier-fed lake, this hotel is just steps from the base of Whistler Mountain and Creekside Gondola. Take the complimentary shuttle to the village or wander along the lake side stroll on the Valley Trail. During your stay enjoy on-site dining or try house-baked goods from the lodge's very own bakery. Other amenities include a year-round lakeside pool and hot tub, fitness center, spa, yoga and complimentary WiFi. Complimentary rentals from snowshoes, bikes to paddle-boards are also available. Overnight at the Long Beach Lodge. This accommodation is a luxurious resort nestled on the edge of Cox Bay, boasting spectacular views of Clayoquot Sound. During your stay, enjoy access to the hotel’s Great Room, a gathering place in the heart of the Resort with ocean views, comfy chairs, a fireplace, restaurant and lounge. Other hotel amenities include guest laundry facilities if needed, fitness centre, hot tub, and a Surf Club Adventure Centre. Return ferry from Vancouver to Vancouver Island for one vehicle and passengers including reservation fee. Occasionally, activities may vary at time of travel due to weather conditions. Your Vacation Advisor will provide advice on the best timing for outdoor activities. Everything was perfect! We loved the combination of the Rocky Mountaineer with a self drive trip.